Nestled inside the JCC's award-winning preschool in the heart of Maitland, Shayna’s Village is a place where parents can take creative classes with their infants, toddlers and preschool-aged kids—regardless of whether their children are enrolled in the school. As children get a little older, they take creative classes independently. We welcome families from all faiths, cultures and backgrounds. Open to the community—enrollment in the JCC's preschool is not necessary to participate. Children need to explore their creative side early on—and we give them the space to do it—whether it’s visual art, cooking, gardening, singing, guitar, or video production. Even more importantly, young children need an opportunity to practice manners and social skills. We help each individual child, no matter how young, to gain confidence in handling new situations. Hi! I'm Karen, the director of Shayna's Village. I look forward to inviting you to participate in our classes and join the Shayna's Village family. This is such a special time in your life, and I can't wait to join you on this journey! Join us at any time if the session's already started—we'll prorate the fee! Get ready to rock in this music class designed especially for you and your baby! Each week you will enjoy different styles of music while participating in activities that promote bonding, singing, and family fun! designed to give parents and caregivers a chance to spend meaningful time with their child while bonding and learning together. The children will enjoy outdoor play as they participate in multi-sensory activities that include all areas of our outdoor classroom. The children will develop fine and gross motor skills, body awareness, strength and flexibility, while having fun through creative music and fitness activities. Enjoy time with your children as they gain independence and confidence in this class and begin to follow a school routine that is chock full of learning activities and gross motor practice. Includes snack. Future artist will discover the world of art as they learn about and experiment with different art media. They will also create a portfolio to store all of their projects. The children will reap the therapeutic benefits of outdoor play as they participate in activities that include all areas of our outdoor classroom: music stage, dirt digging, planting, block building, and art. Future musicians will get to unleash their musical abilities as they participate in creative musical activities and performances. They will play with maracas, scarves, and the parachute. They will learn how to use a microphone and how to be a polite audience member. The children will begin to learn about basic kitchen principles, such as measuring, pouring, and nutrition in the specially designed cooking class. Each week they will make a new recipe. Children will get to sample all of the engaging areas of the Village. Each week, they will participate in different activities in different areas. The six areas include: Science, Drama, Library, Kitchen, Art and Garden! In this class the children will become photographers as they capture moments, landscapes, and people around the JCC. They will learn how to display their photos in creative ways! CAMERAS ARE PROVIDED FOR EACH CLASS. 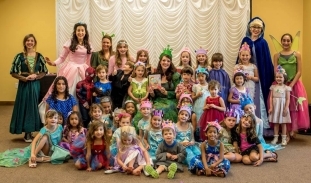 Theatre South Playhouse will help your little actors learn the basic principles of drama through creative play. This class will end with a “classformance” featuring your very own young actor! Through songs, stories, competitive games, and role playing, the children will learn how to be the kind of person everyone wants as a friend. In this one-of-a-kind class, the children will be introduced to guitar, rhythm, singing, and music theory in a group setting. This simple approach will improve your child’s fine motor skills, social interactions, confidence, and stage presence. Guitars are provided for each class. This class is a music enrichment for little ones who love music and love to sing. The children will explore a variety of instruments. They will have vocal lessons as well as learn about musical symbols, rhythms, tempo, dynamics, and steady beat. All of this will improve their listening skills. This is a 30 minute class between 9:30-11:00am. This is a beginning music class for children who like to sing. It will include vocal exercises, matching pitches, singing loud and soft, and even practicing duets and trios. As well as singing, they will learn some simple choreography. There will be a performance at the end of the session. This is a 30 minute class between 12:30-2:00pm. This is a beginning keyboard class. Children will learn finger numbers, the musical alphabet, music signs/symbols, and rhythm-reading, all of which will improve beginning reading skills. This class will also improve listening skills through vocal training. Keyboards will be provided during class. This is a 30 minute class between 12:30-2:00pm. Fridays are a special time at Shayna’s Village, as we offer a number of free parent-child experiences to JCC member families and families with Village Passes. Stay with your child and enjoy our musical celebration together in the JCC auditorium. Come snuggle and read stories together in this open Library time. Enjoy guest storytellers. Please register in advance. Enjoy complimentary challah bread with your child in the Creative Cafe and then stay and play! Please register in advance. Enjoy a 30-minute interactive concert with lots of music, movement, and instruments! Please register in advance to register@orlandojcc.org. Parenting can be tough — but you’re not alone. Shayna’s Village is here to help. All “You’re Not Alone” programs are free for JCC members or with your Village Pass. Learn effective parenting techniques—from each other! New parents, experienced parents, grandparents, educators...all are welcome to share their ideas at these scheduled meetings. Have a fussy eater? Potty training woes? Dealing with tantrums? Schedule a private parenting support session and get answers to all of your questions from a parenting expert. At first I just came to a mommy and me style class, and pretty much immediately signed her up for anything and everything that we could fit into both of our schedules, and it just keeps getting better and better! We have spent the most time with Karen whose gentle guidance and philosophy towards child development inspires me to be a better parent. She has become my go-to for parenting questions and advice and always makes time available. Our child loves her and continues to make so many friends. Shayna's Village holds a special place in our family's heart. I had visited many other preschools and parenting programs in the Orlando area, but none compared to what I saw at the J. The child development philosophies that the preschool and Shayna's Village possess are like none other. I highly recommend Shayna's Village to anyone who is searching for a place for their child to thrive and for guidance in our world's ever changing parenting challenges. New to Shayna's Village? Let us walk you through the sign-up.